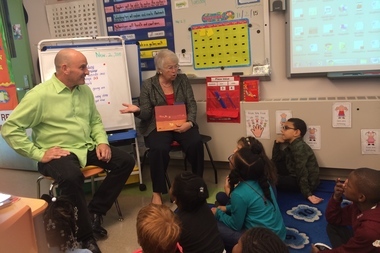 Children's author Jon Scieszka and Schools Chancellor Carmen Fariña read a book to second graders at Park Slope's P.S. 133. BROOKLYN — Schools Chancellor Carmen Fariña spent Monday morning reading to a second-grade class at a Park Slope school to launch a new literacy initiative — where one little boy summed up all parents' worst fears about a test-centric school system. When Fariña asked students at P.S. 133 what the point is of reading your favorite book over and over again, a bright-faced little redhead replied: "to go to a different level" on tests. The chancellor replied: “Absolutely, but sometimes we have to remember that we read not to just go to another level or pass a test but just because it’s a lot of fun." NYC Reads 356, which carries an initial cost of $540,000, will help supply schools with roughly 40 newly published books to add to their libraries, school officials said. It also aims to promote daily reading by giving parents age-appropriate reading lists that will be updated annually. She added: "The paradigm has to shift: reading for pleasure." The DOE is coordinating with the city’s libraries to ensure they have extra copies of the books on the list and will be training parent coordinators on how to use the book lists for their own schools. The list is also aimed to help make it easier for parents to select books based on experts' picks. “Let kids choose a book. Let them be part of that process. Let them read for enjoyment, which we’re losing,” said children’s book author Jon Scieszka and former city elementary school teacher, who joined the chancellor for the event. Testing has dampened some of the pleasure of reading, he acknowledged. Fariña emphasized that she’d like to see schools incorporate these books so it’s not just about the story itself, but also about sparking ideas. “Books should be conversation pieces. They shouldn’t be about memorizing certain words," Fariña said at the school, which has diversity benchmarks as part of its enrollment policy, setting aside 35 percent of kindergarten seats for students who receive free lunch and those who are learning English. The initiative aims to build on the city's "universal second grade literacy plan," in which reading specialists will be provided for all 76,000 second graders in every school across the city by 2018. Only 30 percent of third graders are proficient in reading, city officials said.